“Serving Communities… Above and Beyond” is not only the slogan of the Civil Air Patrol, a nationwide, non-profit, all-volunteer organization, but it is also the perfect slogan for the Harkness family. 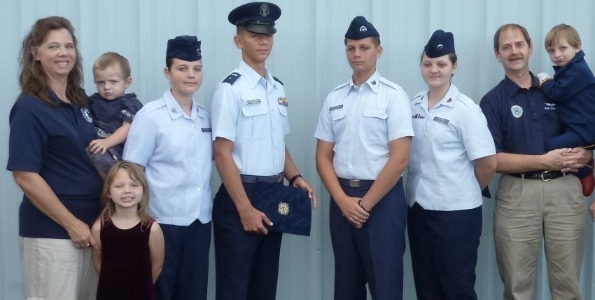 Of the nine members of the Harkness family, six are actively serving the Big Island community via the Lyman Field Composite Squadron of the Hawaii Wing of the Civil Air Patrol (CAP). The only reason the other three family members aren’t in CAP is because they haven’t reached the minimum age of 12 years old! The family’s passion for aviation and serving others began more than seven years ago, before the three younger children were even born. In 2003, parents Dean and Keriann Harkness and their four older children: Aaron, Nathanael, Abigail and Elizabeth, traveled to Kenya as missionaries. They served with a Swiss company that flew in medical supplies to remote regions by helicopters. Their time spent in Africa left an indelible mark on the family and gave them a passion for flying and serving those less fortunate. After moving to Hawaii in 2004, they heard about the Civil Air Patrol when the Experimental Aircraft Association sponsored free flights in general aviation planes at the CAP hangar as part of the Young Eagles program. When they learned CAP offered their own orientation rides in a Cessna plane as part of their Cadet Program for youth, the boys could hardly wait to sign up. The first Harkness family member to join CAP was oldest son Aaron, who joined two days after his 12th birthday in 2005. As a homeschooler, he was interested in flying and learning about the Emergency Services portion of the Cadet Program. Aaron, now 18, has worked his way up through the cadet program, earning the General Billy Mitchell Award and the rank of Cadet 2nd Lieutenant. He currently commands the squadron’s Tango Flight. Aaron has also been taking private flying lessons from CAP volunteer pilot and certified flight instructor, Captain Terry Way. He has already soloed and just needs to take and pass the final tests to earn his private pilot’s certificate. Dr. Clarence “Dean” Harkness, father and patriarch of the clan, joined CAP shortly after Aaron. He decided since he was already driving Aaron to the CAP hanger for meetings, it seemed a good way to both volunteer and share time with his son. Dean holds the CAP rank of Major and is the squadron’s Medical Officer, Cadet Testing Officer and is a qualified Scanner on flight crews. Dean has a private and commercial helicopter’s license, spent three years in the Army and eight years with the National Guard Army Reserves. He is a licensed podiatrist and his other “paying” job is running the “Foot Health Clinic” in Hilo. The next Harkness to join CAP was second son Nathanael, who also joined as soon as he was 12 years old in 2006. Nate, now 17, holds the rank of Cadet Staff Sergeant and was the squadron’s Color Guard Commander, but now participates on the squadron’s air riflery team sponsored by local VFW Post 3830. He also plans on taking private flying lessons, hoping to solo by his 18th birthday. One year later in 2007, Abby joined CAP as she too wanted to learn to fly. She loved her orientation flights and currently holds the rank of Cadet Staff Sergeant. Abby, now 15, likes learning about leadership and teaching others. She is the artist in the family and feels the skills she is learning at CAP will help her in whatever she chooses to do. Lizzy decided to join CAP two years ago in 2009 because she likes flying and marching with the color guard. “I think CAP is great for girls – it gives them a lot of confidence to do things they might have never done before,” Lizzy said. Lizzy has earned the rank of Cadet Technical Sergeant and is a 1st Element Leader. She hopes to be an ER nurse or pediatrician and go back to Africa someday. Keriann, mother and doer of all things, is the latest (but hopefully not the last) Harkness to join CAP. She was kept busy at home with the birth and raising of her three youngest children: Hannah, Caleb and Joshua and homeschooling the whole clan. But when she saw there was a need for more senior member help at the squadron, she decided to join and now swaps volunteer nights with husband Dean. When it is her night at CAP, she is volunteering as the Supply Officer, taking care of all the uniform needs of the cadets and senior members, while Dean stays home with the younger kids. She has also coordinated several fundraisers for CAP, and is currently working on an Auction fundraiser, a first for the squadron. Having the whole family involved in the same organization helps with transportation and coordination, though it takes some juggling to split commitments between CAP and their church, Puna Baptist. CAP can make for friendly competition among the siblings, where they all understand what is going on, the military-style “lingo” and testing requirements; but they can also help each other out with studying or learning drill moves. However, things can still get hectic at times, especially when they all have to have their uniforms ready for meetings or activities. “It’s a rule in our family that whoever is higher ranking gets any piece of uniform that is missing from a lower ranking sibling” Nathaniel said. “CAP is perfect for us because the aerospace and leadership curriculum is great for supplementing our homeschooling, and the organized activities provide good opportunities to be involved with the community,” Keriann said. “CAP has taught my children leadership skills, first-aid and emergency training, given them confidence in public speaking, and has excellent moral and core values. “It has also provided Dean and I with a great way to share our passion for aviation and service with our kids, and will hopefully be a stepping stone in our path back to serving as missionaries in Africa,” she said. The Lyman Field Composite Squadron Cadet Program is for youth ages 12 to 20 years old, and meets 5-8 p.m. every Wednesday at the CAP hangar, on the left as you approach the Hilo airport. The Senior Members meet 6 p.m. the first and third Thursday of each month. For further information on the Cadet Program, as well as the Senior Program, call 935-6927.